Colonel Cockwell assumed his current appointment in August 2016. 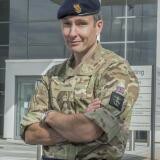 As ACOS J5 for Joint Forces Intelligence Group he is responsible for developing the Group’s long term strategy, medium and short-term plans and – until recently – for oversight of the Defence Intelligence Centre for Intelligence Innovation (CII). As NCGI Deputy Head – Deployable and Commander Royal Engineers (Geographic) (CRE Geo) he has functional responsibility for all aspects of the Royal Engineer Geographic capability and its personnel across Defence, including internationally. Check out the incredible speaker line-up to see who will be joining Roly.